This is a one to one managed media converter that converts a 10/100Base-TX(RJ-45) to 100Base-X via an open SFP port. The open SFP port allows users to customize between the SX, LX, or BX connections. This media converter provides a cost effective conversion from 10/100Base-TX(RJ-45) to 100Base-X, while extending the network reach beyond the 100m reach limitation of copper. Our One to One type manageable media converters are independent standalone systems that do not require a centralized, or unified platform management system. 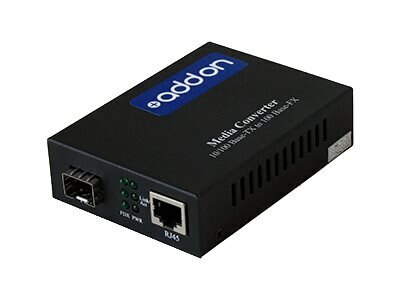 One to One manageable media converters can supervise the real time situation of remote manageable fiber media converters, and allow end users to set the functions remotely. With this system, the response speed of the operator is quickened, the daily maintenance and network expenditure is reduced, and the service quality is enhanced. Our media converters and network interface cards are 100% compliant for all of our networking needs. Now you have a cost effective solution to your network upgrade needs.